Minerva Board members and student competitors at the 2019 ICBC Minerva Human Resources competition. 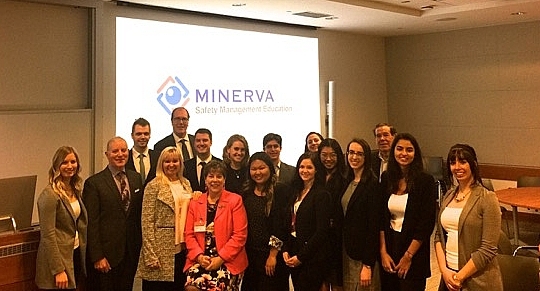 Minerva Canada was again proud to be the platinum sponsor of a health and safety competition during the 2018/19 Intercollegiate Business School Competitions (ICBC) held at Queens University. Over thirty business schools from Canada, USA, South America and Asia participated in this competition. In January 2019, members of the Minerva Canada Board of Directors judged the six finalists in the Human Resources Venue that involved the analysis of a case study. It was focused on the use of Cannabis by employees on a construction worksite and investigates how the new Canadian cannabis legislation was assessed and communicated by management of the construction firm to its employees. Minerva Canada wishes to congratulate the student teams from Concordia University, the University of Calgary and McGill University for placing in the top three positions respectively within the Human Resources Venue. The ICBC case studies sponsored by Minerva Canada are on this website. Minerva Canada is reviewing its ICBC sponsorship plans for 2020.